This is a piece I wrote for the European Geosciences Union blog, GeoLog, and can be found on their website. Back in January I did a talk at an event called Science Showoff, a comedy night based in London where scientists stand up in front of an audience in a pub and talk about funny stuff to do with their work. I talked about video games. Not any video game however, I talked about The Elder Scrolls V: Skyrim. For those of you who don’t know what this is, it’s a fantasy role playing video game. It is a great game with some beautiful graphics, especially the scenery; including flora, fauna and rocks. So I did what any other geologist would do. I mapped Skyrim. This means I used all the internet resources I could to find out the locations of every major ore deposit in the region of Skyrim, colour coded them and placed them on a map. My aim was to find out a possible story for the geological evolution of Skyrim. Like any scientific investigation, you start off with a theory and you commence your investigations to try to prove it wrong. In some cases it is very difficult to prove the theory wrong and so it remains valid, but in most others you do manage to prove it wrong somehow. However, this does not mean that the time and investigations were wasted; instead this process brings up new answers, and questions that scientists investigate further. 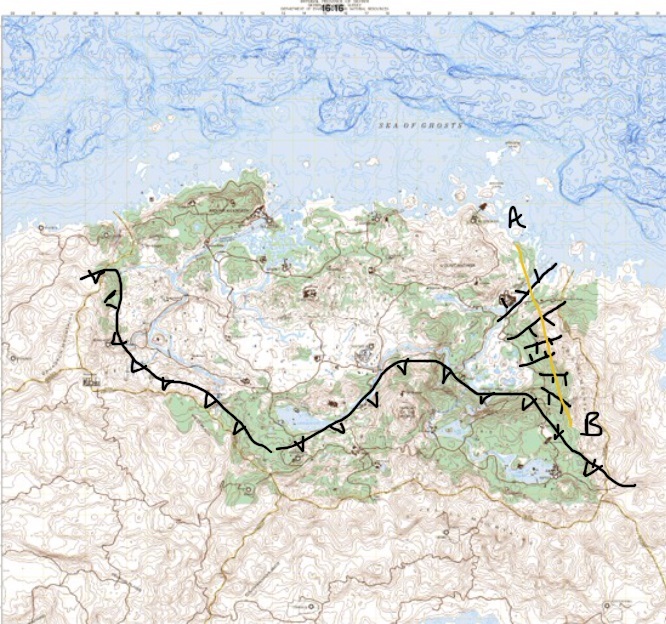 In the case of mapping the geology of Skyrim, I came up with an initial theory that I presented at Science Showoff, and have since found that my initial theory was probably wrong. This doesn’t dishearten me though, it has proved an interesting journey – if unexpected – that I am sure has engaged and enthused many people. First, I will introduce you to my map of all the major ore deposits in Skyrim. I am by no means claiming that this is accurate and I am certainly not claiming that the final interpretation is accurate either (forgetting for a moment we are discussing a fantasy location). My main reason for taking on this little project was to introduce geology to an audience that may not normally engage with the sciences and so the results of this investigation are not meant to be 100% accurate, but they are meant to be inspiring. For a geologist it is not enough to just have a map of where lots of rocks are. What we need is an understanding of the nature of the earth beneath our feet. In finding out how the rocks got where they are today, we can then build up a history of the evolution of the area – including different environments that one area of land went through over millions of years. The most common types of rocks we find in Skyrim are iron ore and corundum. In this world, corundum isn’t actually a rock – but it is a rock forming mineral. Rocks are simply amalgamations of other minerals in the form of crystals or grains. In igneous and metamorphic rocks, formed from cooling magma or changed through heat and pressure deep in the crust respectively, the minerals are crystalline in form. In sedimentary rocks the minerals are generally granular – from other rocks that have been ground down as sediments into their individual minerals. Corundum most commonly occurs as a mineral in metamorphic rocks, so we are going to assume that our ‘corundum ore’ is a metamorphic rock of some kind. It is really important to know in what order the rocks got where they are – which is the oldest and which is the youngest. The map above gives us some clues to the order in which the rocks were laid down. 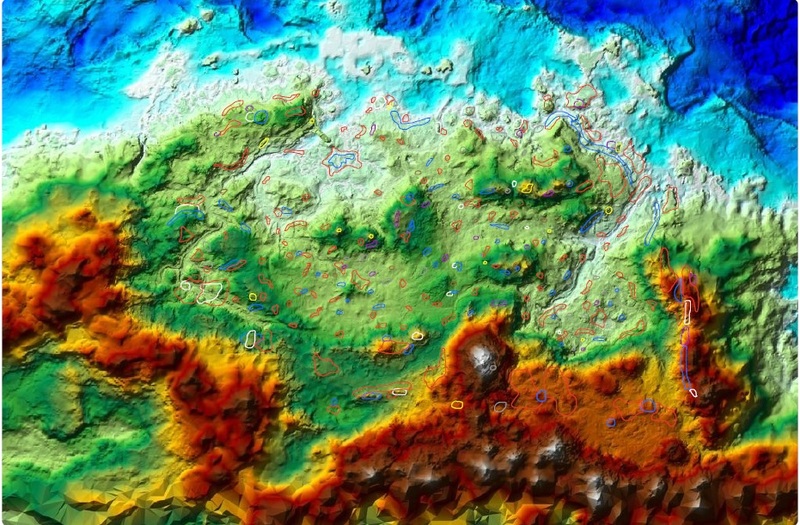 Near the top left there is an area of low topography, and inside this is a red blob with a blue blob in the middle of it. The most likely way for these rocks to be in this formation is that the iron (red) is older than the corundum (blue), so the corundum was deposited after the iron ore. Quicksilver is another name for mercury in our world, the most common ore of which is cinnabar. Cinnabar formation is associated with volcanic activity and hot springs. On the map you can generally see quicksilver (white) associated spatially with corundum and iron ore. If you look closely it appears that quicksilver is usually found on the higher topography, so from this it could be inferred that quicksilver was formed later than both the iron ore and corundum. Towards the bottom left of the province of Skyrim, in the west, you can see a distinct area where there is a quicksilver blob inside an iron ore blob. This would imply that here the quicksilver is directly on top of the iron – but we know that there should be corundum between these two. This is what geologists call an unconformity. An unconformity represents a missing chunk of time in the geological record. When rocks get laid down – by volcanoes or rivers – it takes millions of years. If we are expecting a rock to be somewhere and see that it is missing, we know we are missing a period of geological time in this area and it presents an interesting puzzle: why has this happened? It could be because of tectonic movements of the crust: raising mountains, eroding them then redepositing other sediments on the eroded mountains, but all we see is a road cutting with some different looking rocks and some missing in the middle. This is one of the most important principles in geology, and for many other subjects. It was through identifying an unconformity that James Hutton discovered the concept of ‘deep time’ in 1788 – that the Earth is thousands of millions of years old. Orichalcum is a bit of an enigma. Many historical texts in the real world refer to orichalcum and yet there is a lot of dispute over what kind of metallic material it was – was it an ore, an alloy or something else entirely? From around 428 BC in Ancient Greek texts began implying that orichalcum was chalcopyrite, a copper ore that can be formed in a number of ways, but always associated with hydrothermal circulation and precipitation in either a sedimentary or volcanic environment. Orichalcum can be seen on the map adjacent to quicksilver on high topography, indicating this may be the most recent rock to be formed in Skyrim’s history. 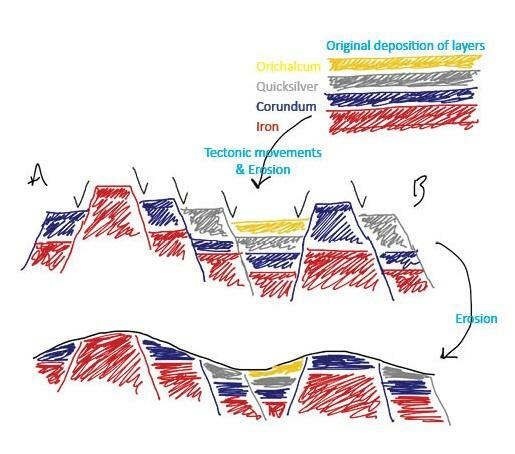 Iron ore in our world is most commonly derived from banded iron formations. These are at least 2,400 million years old! They represent the point from which organisms started photosynthesising and producing oxygen. As these rocks are so old, many of them have been deformed through metamorphism. Knowing how individual rock types form doesn’t tell us the whole story about Skyrim’s evolution though. The crust of the Earth is mobile – in some places it pushes together (compresses) and in others it pulls apart (extension or rifting), destroying and forming new crust in those areas respectively like a large conveyor belt around the Earth. 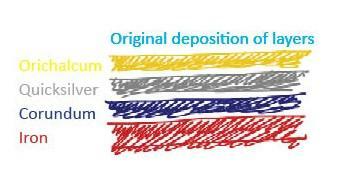 When different rocks that should be on top of another (like in the diagram above) can be seen next to each other on the same topographic level, we can infer that some tectonic movement has happened. In the east of Skyrim, we see an area of higher topography and several of the different rocks aligned next to each other. Skyrim is surrounded to the south and west by mountains, the largest being the Throat of the World. Mountains usually form through landmasses compressing together and bunching up. As this happens the rocks around the area of compression undergo an intense amount of pressure and heat that changes the rocks from their original state – forming metamorphosed rocks. Two of our most abundant rock types are metamorphic – iron ore and corundum. These rocks are also the oldest we see in Skyrim, indicating that for the first part of Skyrim’s history (spanning at least 2 billion years) it was under the sea forming iron ore sediments. A rock, we cannot be sure what it was originally, was deposited on top of the iron ore several millions of years later and then both were squeezed and pushed into mountains and the rest of Skyrim. Millions of years later, the land started to pull itself apart in the east of Skyrim. Extension is a common trigger for volcanic activity, and combined with what could either have been a warm and wet or marine environment quicksilver and orichalcum deposits began to form above the previously metamorphosed rocks. In modern day Skyrim, we still see some hot springs and nearby volcanic activity in Solstheim as well as the east being aptly named The Rift. In response to my post on the Geology of Skyrim, which managed a whopping 60,000 views in the first week it was posted (thanks guys!) I thought it would be good to take a closer look at some of the great comments left about the article. I also did an interview for Bethesda Softworks and this was posted on their blog, and I am really glad to see this also received a large majority of positive comments. It was great to see so many positive comments (also some lovely emails which I greatly appreciate for the time and effort those people have taken to read my article and compose something in response too – thank you! ), and I have to say that out of the 60,000 people who read my blog not one was a troll! Having so many positive comments is a great thing, and shows the willingness of such a diverse range of people to learn, and crucially, as I will demonstrate in this post, engage with science. So here I will provide a breakdown of some of the key comments from the article that broadly demonstrates the kind of reception this type of science communication can generate as well as the level of engagement it can encourage. I have separated the types of comments into several themes, which I will discuss separately. Some of the comments were from readers who liked the game but had either actively disliked geology before or had not come across the discipline. This was one of my primary aims when I began the mapping Skyrim project and wrote the transcript. Helping people become interested in geology in the first place and realising how exciting it can be is also one of my top aims as a science communicator. Some readers subsequently wanted to engage even more with geology, either through a new approach to the game itself or in other aspects of their life. For these commenters the article not only was an interesting read but actually has encouraged them to take this new interest and use it to their benefit – either educational or for fun. This is great, as it shows a passion for learning as well as the potential for games to form the basis of deeper learning, where people can take knowledge and apply it to their own lives and worlds. A few readers were already fans of geology and Skyim, and it was great to see these people enjoy the article as well. I have had some emails and comments from geologists who have enjoyed the work and this is great for me as it helps to ensure that I got my facts right! Connecting disciplines is very important in modern science and research, as well as in science communication. Finding new ways to engage people through disciplines they like as well as recreational activities they enjoy is a great way to engage and enthuse people. What I really liked about a lot of the comments was that so many people wanted to know more. The best thing about these comments is that they show a deeper interest and understanding of the subject matter from reading the post. The fact that readers are asking further questions means that they have really understood what is going on and can use this knowledge to think in more depth about other problems. Even if they are not going to use the knowledge to actively try to solve their questions themselves, the urge to learn more is really promising. Such positive feedback on the project means that I really want to continue with making a mod for the game that incorporates the geology and learning into live gameplay, and hopefully can then reach an even wider audience and result in a much more educational experience (if done correctly!) than just reading an article. Yes, there were some comments that were obviously from super Skyrim fans that pull me up for not being technically correct with respect to The Elder Scrolls lore (the set of games that include Skyrim), but this isn’t trolling, this is just ‘dedicated fanaticism’. I did respond to these comments when posted, and stated my intention when starting the project to make an educational and fun resource that therefore has to include real geology – where Skyrim was a useful analogy to the real world. However, these were the only kinds of negative comments I received. They do however demonstrate some of the difficulties that I may come across when I finally develop a mod for the game and provide a useful insight into the communication barriers I will encounter. What I will take from these comments is that I need to ensure I am clear about the purpose of my project, and that ensuring readers know the boundaries and limitations of my interpretations is important. The ratio of bad to good comments is also very low, and I don’t believe they affect the conclusion that this project was a success. My next steps will be to further define the objectives of the geology of Skyrim project: what kind of learning do I want to achieve (i.e. I believe teaching the questions to ask in order to understand the geology is more important than singular facts)? What is the best way to go about achieving these objectives? For this I may want to take a look at some other science gaming projects such as the Wellcome Trust’s games for inspiration. What is the actual in-game experience going to be like (i.e. how will an in-game quest play out and how will I ensure that it is still fun)? And finally how can I ensure that the mod is accessible to all and that the quest is completable by even those with no knowledge of geology at all? Hopefully, what my post on the geology of Skrim has taught me is that geology can be interesting to everyone, that games are a good way of engaging people with science, and that everyone can find science accessible if it is communicated effectively.